Julián Merino was born in Palacios de la Sierra in Burgos in northern Spain. An activist in the CNT, from 1919 to 1920 he helped set up unions in the sugar factories around Zaragoza, which went on strike in November 1920. Merino was arrested that same month, in possession of a notebook containing evidence of his organisational activity as well as notes for speaking in public. In addition to urging workers to adopt direct action in the struggle against capital and proclaiming ‘Long live anarchist communism!’ the notes also contained the text of a toast ‘to anarchy’ and ‘to Bolshevism’, concluding ‘let the heads of kings shatter like the shards of this glass’ (Gastón 2010: 64-66). In the following years Merino moved to Barcelona where he joined the Maritime Section of the CNT Transport Union. After the Second Republic was declared in 1931 he sided with the radical wing of the CNT in opposition to the more moderate and gradualist sectors – the so-called treintistas. In 1932 he signed a manifesto from the Modelo prison in Barcelona to that effect, and the following year he was arrested and charged with inciting rebellion against the Republic for an article written in Solidaridad Obrera under the pen-name José Bonet. He was arrested again in 1935 on charges of incitement and illegal association. From 1932-1933 many articles appeared in the anarchist press under the pseudonym of José Bonet, as well as the pamphlet ‘Ideas at the service of libertarian communism’, although it is unknown whether these were in fact written by Merino. Merino was by now the FAI delegate to the Barcelona defence committees (Márquez Rodríguez and Gallardo Romero 1999: 80), groups of armed workers initially set up by the CNT to prevent a right-wing takeover of the Republic, but which radicals had conceived as the potential shock-troops of the anarchist-inspired social revolution. During the Second Republic the defence committees of Barcelona were nominally subordinate to the Regional Defence Committee of Catalonia, composed primarily of members of the affinity group Nosotros, among whose number were the so-called ‘Three Musketeers of Spanish anarchism’, Juan García Oliver, Buenaventura Durruti and Francisco Ascaso. On 17 July 1936, two days before the fighting that marked the beginning of the Civil War, Merino and Juan Yagüe led a raiding party onto the boats anchored in the port of Barcelona and carried off their stores of weaponry, distributing them among activists of the Libertarian Youth. The event caused consternation among the members of the Regional Defence Committee of Catalonia, which had to intervene in order to avoid a state of emergency being declared. Both Merino and Yagüe departed for the front in the first weeks of the Civil War. The latter, who died at Huesca in September 1936, was a member of the Roja y Negra militia column, and it seems probable that Merino was too, given the high proportion of members of the Barcelona Transport Union in its ranks. In October, Merino, as a delegate of a militia column, attended the famous Plenum at Bujaraloz that agreed to the constitution of the Regional Defence Council of Aragon (Ascaso 2006: 24). By early 1937 he was back in Barcelona, possibly as a result of opposition to the militarisation process that converted the militia columns into regular army brigades. As the secretary of the Local Federation of Affinity Groups (the Barcelona FAI), Merino attended the meetings of the regional ‘comités superiores’ and made clear his disagreement with the direction of the movement in this period. At one meeting, much to the annoyance of the majority of attendees, he defended the refusal of the ‘Gelsa section’ – a component of the Durruti Column – to militarise. The Gelsa section would later return to Barcelona with arms in hand, forming the bulk of the initial membership of the Friends of Durruti grouping. With Merino as secretary, the Barcelona FAI became a point of convergence for those sections of the libertarian movement that opposed its continued collaboration with the Republican state, including many members of the Libertarian Youth, the Barcelona defence committees, the Friends of Durruti, exiled German and Italian anarchist groups, etc. This was demonstrated most clearly by a Plenum of the Barcelona FAI held in April 1937 (described in detail in Guillamón 2013: 196-221). The radical positions adopted at this Plenum led to a position paper, co-authored by Merino on behalf of his affinity group, Cultura y Acción, which advocated the withdrawal of anarchists from governmental positions and a return to the ‘revolutionary and anti-state terrain’, comprehensive socialisation and the ‘constitution of a local revolutionary committee for the coordination of the armed struggle against fascism and the counterrevolution, in all its forms’. This position paper appears to have provided an organisational mandate for the ‘May days’ uprising. Merino was a member of the committee that co-ordinated this anarchist mobilisation, which responded to the attempted police takeover of the union-controlled telephone exchange in Barcelona on 3 May 1937. This is attested to by Matías Suñer Vidal, a member of the FAI who participated in the fighting (militants-anarchistes 2016), and is likewise suggested by the recollections of Severino Campos, then secretary of the Regional FAI in Catalonia (Gimenólogos 2009: 567). In his memoirs, García Oliver, who returned to Barcelona during the street-fighting to appeal for calm, recalled seeing Merino at the regional CNT headquarters in Barcelona giving orders over the telephone (García Oliver : 421). Following the May days, Merino continued to swim against the tide from his position as both secretary of the Barcelona FAI and the Barcelona Transport Union. In the former role, he called a Regional Plenum of the FAI in July 1937 that came within a hair’s breadth of agreeing to call on all its members to withdraw from any collaboration with the republican state. In the latter role, he was held responsible by García Oliver for attempting to unleash ‘a second May days’ in August, when members of the Barcelona Transport Union resisted an attempt by the police to register their headquarters. At a subsequent meeting, García Oliver implied that he should be shot. Undeterred, Merino continued to organise at the margins of organisational discipline, maintaining the Local Federation of Affinity Groups even after the founding of the much trumpeted Agrupación Anarquista de Barcelona (Barcelona Anarchist Grouping – an attempt by the ‘comités superiores’ to organise the FAI on the basis of individual membership by locality as opposed to by affinity group affiliation), and attempting to revive the traditional prisoner support committees in opposition to the CNT’s Legal Commission, widely considered inadequate in its response to the increasing repression of anarchists in Spain. Given this trajectory, it is hard to explain how Merino ended up forming a part of the Executive Committee of the Libertarian Movement in Spain, from April 1938. This body was formed to impose organisational discipline on the movement’s more recalcitrant members and can be viewed as the culmination of everything that Merino had fought against for over a year previously. 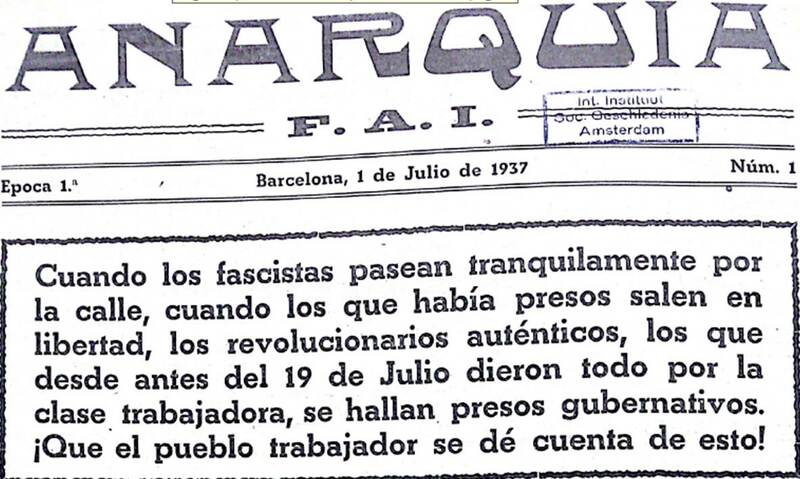 Days before Barcelona fell to the fascists in January 1939, Merino was charged with organising remaining anarchists or anarchist sympathisers into defence battalions in the name of the FAI. In the event however, a suicidal, last-ditch defence of the city was not attempted, and Merino crossed the border into France with thousands of his fellow defeated comrades. He died in Venezuela in April 1977.